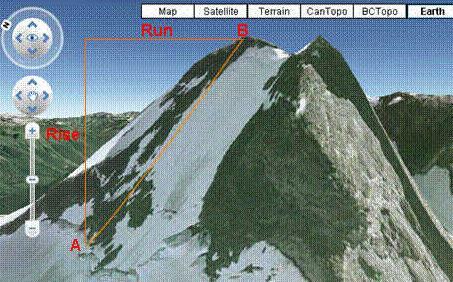 Two areas of mapping we need to work on are the skills of calculating gradient and vertical exaggeration. 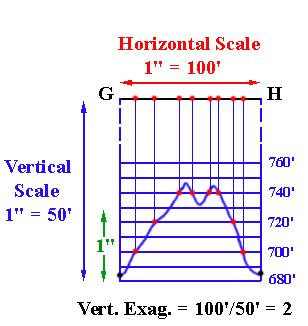 Vertical exaggeration simply means that your vertical scale is larger than your horizontal scale (in the example you could use 1 cm is equal to 1000m for your vertical scale, while keeping the horizontal scale the same). Vertical exaggeration is often used if you want to discern subtle topographic features. Vertical exaggeration formula: VE = (real world units of horizontal scale) / (real world units of vertical scale). 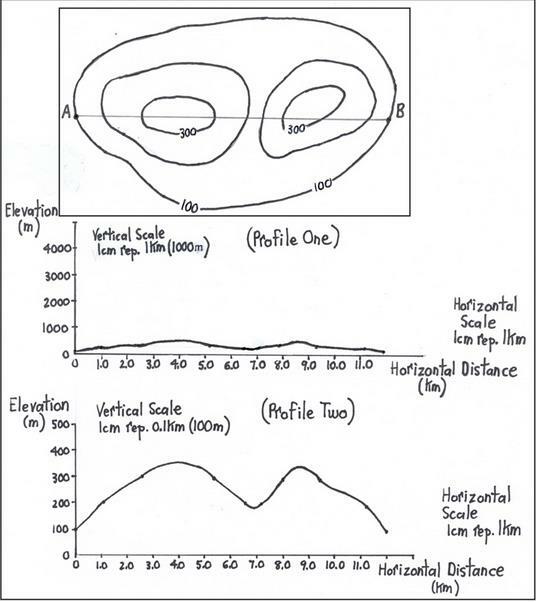 As an example for a 1:50000 topographic map, we can set the horizontal scale (x axis) of the profile the same as the map. * Labeling 1 cm units on x axis: 1cm on map = 50000cm in real world = 500m in real world. If we decide to use the same value for our vertical scale (1cm = 500m for y axis), then there will be a vertical exaggeration (VE) of (500m / 500m) = 1x or no vertical exaggeration. * Changing our y axis scale so that 1cm would represent 250m then we would have 500m/250m = 2x (read 2 times) vertical exaggeration. Another explanation of how to calculate vertical exaggeration? You basically look at the vertical scale and the horizontal scale and convert them to the same unit of measurement. Metres is usually the best one. i.e. The vertical exaggeration is 20. Just remember that when you're trying to calculate the vertical exaggeration on a topographic map, it won't always be a whole number so you'll be expected to round it to the nearest one. 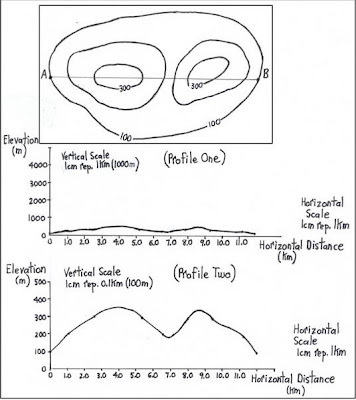 To determining the average gradient (slope) of a hill using a topographicmap. Decide on an area for which you want to calculate the slope (note, it should be an area where the slope direction does not change; do not cross the top of a hill or the bottom of a valley). Once you have decided on an area of interest, draw a straight line perpendicular to the contours on the slope. Measure the length (run) of the line you drew and, using the scale of the map, convert that distance to metres. Calculate the difference in height between the two points, then calculate the difference in length between the 2 points and divide. So lets say you have a rise of 100m and a run of 1000m. It means the gradient is 100/1000, but the numerator must be 1 so that would equate to 1/10, or 1:10. It means that for every 10m you travel, the height goes up by 1m. Also make sure the rise and run are in the same units. In this case the gradient can be explained as 1 in 10 or 1:10 or 1/10 or 0.10, which means that for every 10 units travelled horizontally, the ground rises (or falls) one unit vertically.